Once the engagement ring is purchased, it is time to find the perfect wedding dress. Wedding dresses are a high-ticket, once in a lifetime purchase. While there are a collection of reality shows and articles sharing the inside scoop on what is in trend and what is not, there is still a lack of professional advice on the gown purchase process. I know it’s way more exciting talking about things like Bridal Fashion Week; however, my hope is every bride enjoys the dress process from beginning to end. Buying a wedding dress can be an emotional process. The more knowledge you have going in will make things more enjoyable and less stressful. After fifteen years as a bridal industry expert, I’m here to share my top questions every bride should be asking before they say “yes”. Every boutique is different; however, most boutiques operate as “final sale.” Whether it be an off-the-rack dress or a special order gown, “final sale” is a standard. Most designers do not have a storage facility to hold onto returns. Bridal designers are in many ways very small businesses unlike our go-to ready-to-wear online boutiques. From a bridal boutique’s perspective, it could take a store owner months or years to find another bride for the dress. There are a handful of online bridal sites offering returns, but the challenge is they may hold onto your money for up to a month. Look at the final sale policy as a positive. You have to know when to stop shopping and enjoy the dress you found. Every boutique operates differently when it comes to alterations. Often bridal boutiques hire seamstresses as full-time employees while others have partnership agreements. Occasionally, you will see bridal boutiques not offering in-house seamstresses. Instead they provide their clients with a list of recommended seamstresses in the area. If the dress you are considering needs extensive alterations or custom changes, it may be best to work with a full-service boutique offering an in-house seamstress option. When we hear special order, we think custom. Special order in bridal does not mean the dress will fit you like a glove when it arrives. Your bridal boutique will measure your bust, waist, and hip. They will plug these measurements in the designer’s size chart to determine the closest size. You should still expect alterations. Designers do offer custom gowns for additional fees. When you hear a stylist say “special order,” this is the perfect time to ask what they are meaning by the term. This question is for those needing peace of mind. If you are special ordering a wedding dress, knowing the location it is being produced in is incredibly important. Dresses made in the U.S. or Canada tend to not run behind as there are less parties involved and shipping is quicker. If a dress arrives with a flaw, the resolution time is faster given it doesn’t have to be shipped overseas. Depending on your wedding date, this question can have more value. Peace of mind is everything when you are weeks away from your wedding. Is it possible to order extra material from my dress? Whether you are looking to add a capped sleeve or create a flower girl sash, having the option to order extra material is incredibly helpful. Some designers do not sell the fabric from the gown. This is a concern when it comes to alterations. There are many reasons why a seamstress may need additional fabric. For example, when the CrossFit trend started, we saw brides getting toned while gaining inches of muscle. In this case, a seamstress may need to replace a panel to give you more room. How long has the designer been in business and do they have reputable stores? We have all seen the horror stories of bridal boutiques closing without notice. What we don’t always hear about are the designers. There are new bridal designers entering the market every week. Unfortunately, not all of them will make it. Check to see how long the designer has been in business and who their other retailers are. If they are carried in established boutiques that is always a good sign. Tali Gallon is an owner and stylist of The Bridal Finery located in Winter Park, FL. The boutique offers a new concept to luxury bridal. Wedding Emergencies….They Happen! Are You Prepared? Stop the emergency before it happens by having some security and standards in place. Many wedding venues require security, such as an off-duty police officer, to make sure the event runs smoothly and there are no issues with unruly guests or damage to the property. Is security common? Yes! Are these issues common? No (thankfully!). The presence of security alone is usually enough to deter wedding crashers, drunk drivers, and family drama that has gotten out of hand. Repeat after me: No one will take shots on my wedding day. Now say it louder for the people in the back (especially the groomsmen!). Over indulging in alcohol can make your wedding turn into a party that you were not intending to have. Hiring a licensed and insured bartender is key. They will not only limit alcohol for guests that have over done it, but they will also institute rules like no shots or keg stands (hey, this isn’t a frat party) so your guests don’t get too far gone in the first place. Oh, and that million dollar liquor liability insurance policy they bring should definitely help ease your mind as well. Food allergies, heat stroke, bee stings… all of these can happen, but they are more likely to happen if you don’t take good care of your guests in the first place. When choosing your catering menu, ask around for any food allergies or diet restrictions you need to be aware of (sometimes I see this on the RSVPs!). If you are having an outdoor summer wedding have fans, cooling stations, and plenty of water. Talk to your venue about their policy on pesticides and spraying for bugs (most commercial venues have a routine for this) and see if you need to offer your guests bug spray or have citronella candles lit outside. I once had a wedding that decided to spoil the kiddos with a bounce house during the reception. It was great, until the 4 year old ring bearer bounced right out of the house, on the ground, and broke his arm. Making matters worse, we were in the mountains with no cell phone service and all of the guests were from out of state and unfamiliar with the area. Because I was knowledgeable about the location of the nearest hospital, I was able to tell the parents directions to the nearest ER. Do a quick online search of facilities near your venue, or ask the venue owner, and have the address handy or printed directions if you won’t have service or wifi. During an emergency, minutes matter, and getting someone medical attention as fast as possible can make all the difference. I hope these getting started tips help you feel a little at ease so if something goes wrong, you know you have it covered! Lindsay Ruggieri owns The Bride Link, a wedding advice and planning website, and also owns Custom Love Gifts, Events, & Prints, an event planning company that specializes in wedding details such as invitations and gourmet wedding favors. Kids are cuckoo. That’s just a fact. Some people choose to have a kid-free wedding, and with the wiled coyote antics of those little bundles of energy, it’s easy to sympathize. We invite you to consider the alternative of inviting those balls of sunshine to bask in your wedding bliss glow, and crank that reception into high gear. 10. These kids that are stayin alive, stayin alive, ah-ha-ah-ha…. Planning on having a kid-friendly, or kid-free wedding? Tell us about it in the comment section below! 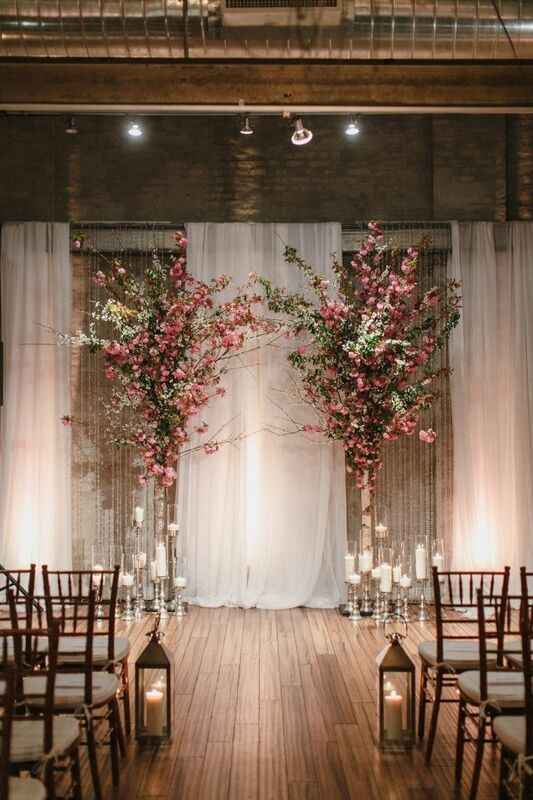 What elements are you including in your boho wedding? Tell us about it in the comment section below! How fun is this idea of setting up a giant video game display? Either make use of a big white wall or set up a projector screen and then let the dance dance revolution take over your reception. Call it The Newlywed Game with a twist. Sit back-to-back with your newly-minted husband, take off one of your shoes and trade him for one of his. Have your guests ask you questions about your relationship, and then you both hold up the shoe of the person you think best fits the answer. Have every guest stand up at their table. One by one, eliminate people with certain criteria (i.e. If your birthday is the last day of the month, sit down.) The last person standing, gets a special prize! There’s nothing more quaint or classy than a nice & colorful wooden croquet set. Invite guests to the field, have them pick their color, and let the mallets fly. We love this Price-Is-Right “spin” (see what we did there?) on the classic kissing game. If you don’t happen to have a giant wheel lying around, you can always use a spinner from an old board game. Drink. flip. drink. flip. Bring everyone back to the fun-loving, all-flipping days of college, and they’re sure to have a blast. Have an Instagram contest that your guests can participate in, using a unique hashtag created just for your wedding. The winner can receive a prize, at the end of the night, or soon after, for the best/most unique photo taken at the wedding. Not only will guests have fun searching for that perfect snap, but it’s a great way to get more creative photos from your wedding. Place one of these decorative beauties at each table, and let your guests spend hours having fun while getting to know you and your fiance a little bit better. As hard as you try to make sure that your guests are seated together by association, but you’re going to have to combine a few strangers no matter what. This icebreakers game is a great way to loosen everybody up with some fun instead of forced conversation. This one gives your outdoor reception a good old fashioned carnival feel. Guests will “step right up” to prove they’ve got the best hand-eye coordination of all your friends. Plus, it’s fairly inexpensive to put together. What games are you planning on having at your reception? Tell us about it in the comment section below! One of the first things you will deal with when planning your reception is the age-old dilemma of a buffet style vs. plated wedding dinner. Which is less likely to break the bank? Which one will make your guests jump with delight and make their glands salivate? Check out our blog for the pros and cons of both options! With a buffet style dinner, all courses are served on different tables, and guests are invited table by table to come up and serve themselves. There is usually no table plan at a buffet dinner. Pros: Buffet style usually offers a wide variety of food for your guests so that there’s something for everyone (remember to include a vegetarian main course.) This option will save you a bit of money on the amount of service staff needed. A buffet also provides opportunities for your guests to mingle and warm up to each other before hitting the dance floor for some uptown funk action! Cons: People usually think that buffets are cheaper than seated dinners with set menus, but that’s not always true. 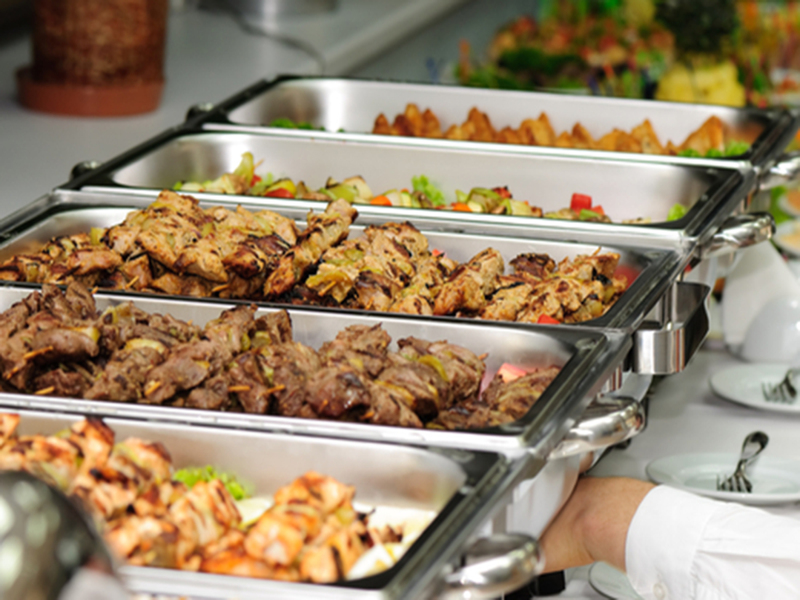 Usually, the caterer will make a lot more food than will be eaten so that it doesn’t run out. Because of this, buffet style dinners can create a lot of wasted food. This arrangement can also get a little crazy and people can end up waiting a while to eat if certain guests are slower at getting their food. Tips: You can really up the elegance of this option by decorating each buffet table with intricate little details. Present each dish in unique, and beautiful serve-ware and serving utensils. Combine cold and hot dishes with finger food options. You can also include a fresh-cooked option, i.e. having a chef prepare sushi or wok dishes right at the table! The plated dinner is generally the most traditional of the different dining options for a reception. The Bride and Groom constructs a table plan which gives each guest a place at a particular table (usually denoted by specific associations or circles) and guests are served a 3 or 4 course set menu. Pros: You will usually save money on the amount of food, because the caterer will know exactly how much to buy based on your numbers. Your guests won’t have to worry about finding a seat or people to sit with, because this is prearranged for them. Also, everyone will be fed around the same time, so hopefully you don’t have too many hungry guests! Cons: The staff portion of your bill will be a bit higher, as you will need more servers per guests. Since there are fewer options with a pre-planned meal, you might have certain guests who won’t be able to eat everything and might go hungry. Tips: Give guests at least a couple of options for the main course. Send out a meal choice option with their invitations, so you can get this info to your caterer long before the reception. Avoid any options that might be considered too exotic so you can be more safe. That’s it for now brides! Are you planning on having a buffet style or plated dinner for your reception? Tell us about it in the comment section below!